Today we're saying eff you to clean eating and embracing the weekend in all its buttery, sugary glory. We've tracked down the most ridiculously calorific, hedonistic, indulgent meals from Brisbane's best restaurants. From triple stack burgers, to bacon ice cream, pina colada cronuts, and peanut butter with everything, these are Brisbane's best fat feeds. The diet starts Monday. Bavarian Bier Café's Chilli Cheese Burger, with char-grilled Wagyu beef on a brioche bun with chilli con carne, cheddar, jalapeño, crispy onions, Sriracha, and aioli. Yard Bird's Chilli Cheese Fries—shoestring fries with chilli con carne or vegetarian bean dip, Mexican cheese, jalapenos, drenched in Yardbird's southwest sauce. South Side Diner's Southside Corn Dog, with banana chilli and chipotle mayo. Papa Jack's Salted Caramel Smothered Corn on the Cob. Mighty Mighty's Devil Dripped Pork Ribs — sweet rubbed and smoked pork ribs, our signature devilled mop sauce, baked Idaho potato, blue cheese cream and honeyed house bacon. At Sixes and Sevens' Poutine—chips, cheese curd, gravy. The Smoke BBQ's Fried Shrimp Po' Boy. Red Hook's Deep Fried Mac n Cheese Squares. The Dirty South's Nashville Fried Chicken with battered fries and gravy. 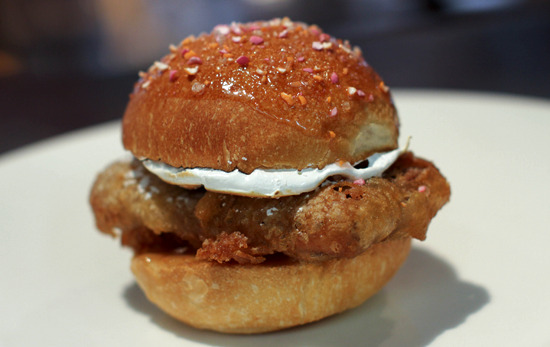 Nantucket Kitchen & Bar's Pork Sliders on brioche with crumbled blue cheese. South Side Diner's Chocolate Peanut Butter Pie with chococlate fudge sauce and vanilla ice cream. Tippler's Tap's Chilli Fries — beer battered fries with beef and bean chilli. The Smoke BBQ's Peanut Butter Pudding. The Baker's Arm's Apple Cinnamon Doughnut Blondies. Southern Attitude's Fried Dill Pickles, with sweet horseradish sauce. Flour & Chocolate's Chocolate Peanut Butter 'Gonuts'. Au Cirque's Brioche French Toast with cinnamon cream, peach jelly, grilled peaches, and hazelnut praline. Spring Hill Deli Café's Sloppy Joe with two fried eggs. The BB Elvis at Ben's Burgers — a brioche breakfast burger with bacon, peanut butter, banana, and maple Syrup. Howzat Burger's Warnie Burger — Wagyu pattie, bacon, and double Monterey Jack cheese. Editor's Tip: Fat this feed further by adding a Nutella Milkshake. South Side Diner's Californian Double Double Burger — Two 150g beef patties with jalapeno cream cheese and iceberg lettuce. Cronut Ice Cream Sandwich from the Chocolate Komberry Co. Food Truck. Red Hook's Peanut Butter and Jelly Waffle Sandwich. Papa Jack's Truffled Mac n Cheese, with a herb and parmesan crust. Bread & Meat Co's Three Little Piggies Sandwich — pork loin, pork belly, bacon, and honey roasted ham, drizzled with balsamic glaze and served on a warm ciabatta. Newstead Brewing Co.'s Chilli Cheese Fries. Artie & Mai's Banana French Toast, with salted caramel and candied bacon ice cream. The Wickham Hotel's Pork Belly Fritters with maple and bourbon glaze and pickled chillis. Lock'n'load's Baked Triple Cream Brie with fig and walnut chutney, and sweet onion bread. Chocolate Komberry Co's Pina Colada Cronut at The Eagle Street Markets. The Alliance Hotel's Pulled Pork Toasted Sandwich, stuffed with Cubano-pulled bbq pork, hot salami, jack cheese, pickles. Ruby Café's Buffalo Chicken Wings, served with blue cheese mayo and sprinkled with bacon dust. Gerard's Bar Sobresaddo—spreadable sausage, topped with honeycomb. South Bank Surf Club's pulled pork sandwich with New York pickles, mustard slaw and hand-cut chips. Bavarian Bier Café Tasting Platter—crispy pork belly, haus sausages, schnitzel, sauerkraut, red cabbage, creamy mash, Granny Smith apple compote, and jus. Ze Pickle's Triple Loco Burger—three Wagyu beef patties, triple Swiss cheese, bacon jam, pulled pork, and mum's slaw, served between two grilled-cheese sandwiches. Just Poppy's 3 Little Pigs Burger—seasoned pork mince patty, bacon, pork riblet, mushrooms, double cheese, fried onion, and plum sauce. The Baker's Arm's Pumpkin Pie Smoothie. Southern Attitude's Southern Smoke Burger—a half pound patty, smoked bacon, onion rings, cheddar cheese, bbq sauce, ranch dressing, pickles. Howzat Burger's Coke Battered, Deep-Fried Caramello Koala Burger with toasted marshmallow and salted raspberry caramel sauce, between two sweet buns. Jocelyn's Provisions' Chocolate Sour Cream Cake, with a salted caramel buttercream filling, finished with a drizzle of salted caramel. The Welsh Lady's Chocolate Mousse Eclairs. How many of Brisbane's best fat feeds have you done? If we missed your favourite, let us know in the comments below. Like this list? You'll love our hit list of 50 Meals You Should Have Eaten if You Live in Brisbane, and our Reader's Choice list!